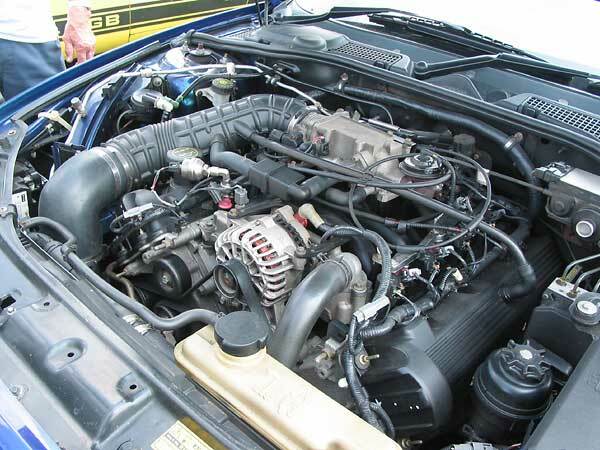 Engine: Ford 4.6L V8, rated at 260bhp at 5000rpm & 302ft.lb at 4000rpm. Single overhead cam. Two valves/cylinder. Induction: sequential multipoint electronic fuel injection. Transmission: Tremec TR3650 5-speed manual, with hydraulic clutch. Front Susp. : Eibach linear-rate springs and Bilstein McPherson struts. Anti-roll bar. Power rack-and-pinion steering. Rear Susp. : multi-link, with a six-mount subframe that houses a Dana Hyrdratrak limited-slip differential. Each wheel is located by three lateral links (two steel and one alloy) and an alloy trailing arm. Compound-rate Eibach springs. Bilstein shocks. Anti-roll bar. According to MG Rover press releases, the rear suspension was developed specifically for the ZT 260 V8, but other reports suggest that the design was sourced from GM's Holden division (in Australia) Some reports indicate that BMW half-shafts were used. (rear) AP-Racing 332mm ventilated discs and opposed-piston alloy calipers. Weight: approximately 1779kg (3890 pounds). Performance: maximum rated speed = 155mph. 0-60mph in 6.2 seconds. 21.5mpg average/estimated. 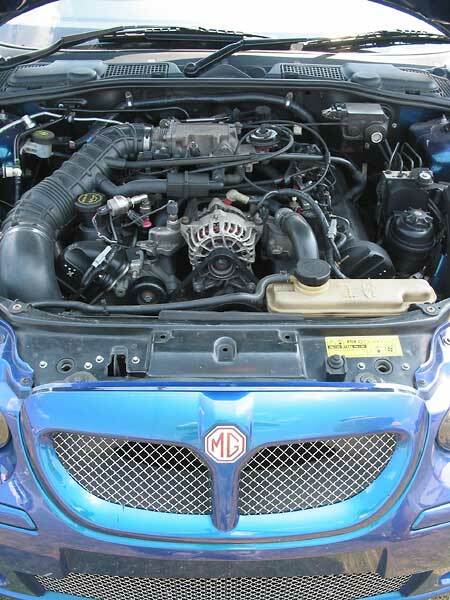 The MG ZT (sedan) and ZT-T (wagon) models were the flagship sporty vehicles of "The MG Rover Group". Since many of our readers aren't very familiar with the lineage that led to these vehicles, we'll summarize it quickly here: British Leyland Motor Corporation (BLMC) was the company that owned and operated MG, Triumph, Austin, Rover, etc. through the 1970's. When they collapsed and were nationalized, the company name was shortened to just British Leyland and car operations were dramatically consolidated. The MG Abingdon plant was closed and its products were discontinued. British Leyland continued to put MG badges on some vehicles, including the "Metro" and "Maestro" sporty subcompacts. In 1986, British Leyland was renamed Rover Group. In 1988 they were absorbed by British Aerospace. Under this ownership, Rover Group offered the MG RV8 and also developed and launched the MGF. In 1995 Rover Group were bought from British Aerospace by BMW. Under BMW ownership Rover engineers developed the Rover 75 model cars (as well as the new Mini). Since BMW was paying the bills, and they didn't want the Rover 75 to compete with their own BMW models, the Rover 75 was deliberately positioned as "conservative" in styling and performance. In 2000 BMW split Rover into three parts, keeping the most lucrative (Mini) part for itself. Range Rover went to Ford. Rover's remaining car products and facilities (including the old Austin plant at Longbridge) were spun-off to become The MG Rover Group. History will record that The MG Rover Group made a pretty valiant effort. After being split from BMW, the company developed and launched highly-regarded sporty versions of the Rover 75 within just one year. As originally introduced, the MG ZT and ZT-T were essentially Rover 75 cars with face-lifted styling and with up-rated suspensions. The company needed a real "flagship" model, and for that they needed a bigger, stronger engine than they could produce in house. 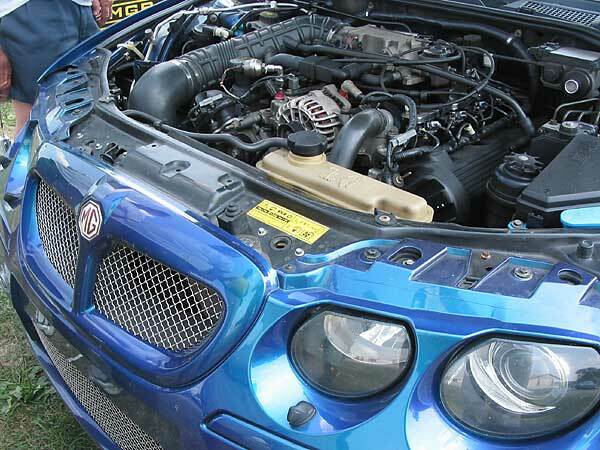 To create a V8 engine option, the company worked with an outside engine manufacturer, outside engineering firms, and they had to substantially modify the Rover 75 / MG ZT chassis. The drivetrain, suspension, and braking systems for the new "ZT 260 V8" models were brand new, and the body featured significant modifications. Philip's car was actually produced very, very early in the ZT 260 V8 model program. According to Longbridge records, the body was the 23rd stamped. Philip's car was originally registered in England as a 2003 model, and it was assigned to the MG Rover Group press office at Longbridge. But it apparently didn't stay there long! Ownership was transferred to one of MG Rover's key development partners, Roush Industries in Livonia Michigan (a Detroit suburb, and yes that's Roush as in "Jack Roush".) Roush used the car for various engineering purposes. Interestingly, they titled the car (in Michigan) as a 2006 model even though MG Rover Group actually ceased all production and went into bankruptcy on April 15th, 2005. It's a great pity that MG Rover Group ran out of money just as they were hitting their stride in terms of product offering. 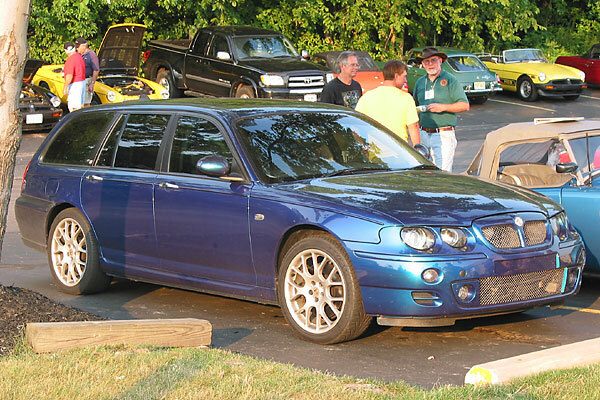 Only about 700 MG ZT-T 260 V8 cars were ever produced. A former MGB V8 owner himself, Philip reports that his ZT-T is a great driving car with a very willing engine. The car is as comfortable cruising at 85mph as it is idling in the driveway. When the car does need service, the drivetrain components are all readily available and familiar because they're basically standard Ford parts - right down to the subtle Mustang emblem cast into the top of the throttle body assembly! 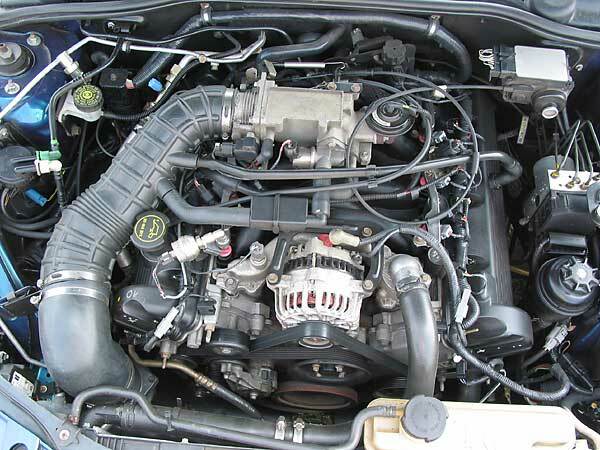 Ford 4.6L V8 engine, rated at 260bhp at 5000rpm and 302ft.lb at 4000rpm. Coincidentally, in the background here you can just see Jack Renaud's MGB. Jack is a retired Ford engineer. Philip reports there are a few extra sensors and wires on the engine, left over from its time at Roush Industries.